Robin Ann Cooksey, 58, passed away on Thanksgiving Day of 2018, surrounded by her family and friends. Robin graduated from Medina High School, class of ’79, where she was a star athlete. After High School, she went on to attend Texas A&M, where she graduated with Honors in 1983. After Robin and Bill married, they moved to Elgin, where they built their home. Robin enjoyed her life in Elgin, where her and Bill rescued and loved their many cats, dogs and horse. Their beautiful home had a lily pond in the front, where they loved to enjoy the wildlife and birds that ventured up for a drink. 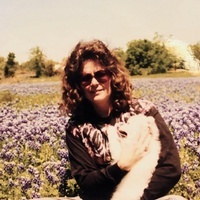 Robin worked for the State of Texas as a Health Inspector and later as a Health Physicist in the Texas Radiation Control Compliance and Inspection Program. She continued her career with the State in the Commission on Environmental Quality as a Health Physicist in the Environmental Radioactive Material Licensing Program until her health began to decline due to her long-fought battle with Multiple Sclerosis and Parkinson’s Disease. Robin was preceded in death by her husband, Bill Silva; her parents, J. L. and Linda Lee Cooksey; and father-in-law, John Silva and his wife Naomi. Robin is survived by her two brothers, Richard Cooksey of Boston, MA and Robert Cooksey of Austin, TX; her cousins, Darren Allen of Albion, NY, Curt Allen, Shawn Allen, and Heidi Allen Reimer all of Medina, NY, Jim Proiety of Dallas, TX, and Stan Roper and wife Sherry, Holly and D. J. Roper all of Round Rock, TX; her aunt, Donna Allen of Albion, NY; and numerous nieces and nephews and dear friends. Memorial Contributions can be made, in Robin’s Memory, to the Bastrop County Animal Shelter, 589 Cool Water Drive, Bastrop, TX 78602. Friends and family are invited to a Celebration of Robin’s life at the Elgin Funeral Home on Saturday, December 1st at 11:00 AM. Prior to the service, the family will receive guests from 10:00 AM until 11:00 AM and interment will follow at Cook-Walden Memorial Hill Cemetery, Pflugerville, at 2:00 PM.